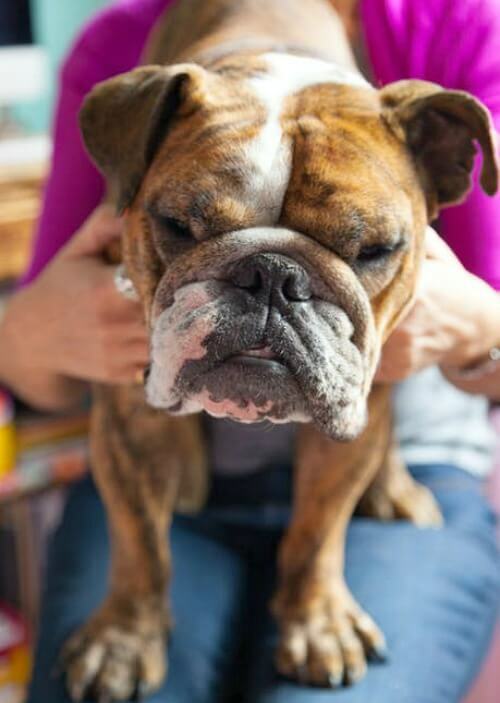 Jeanie and her dog Tator Tot live in the East Village in New York. 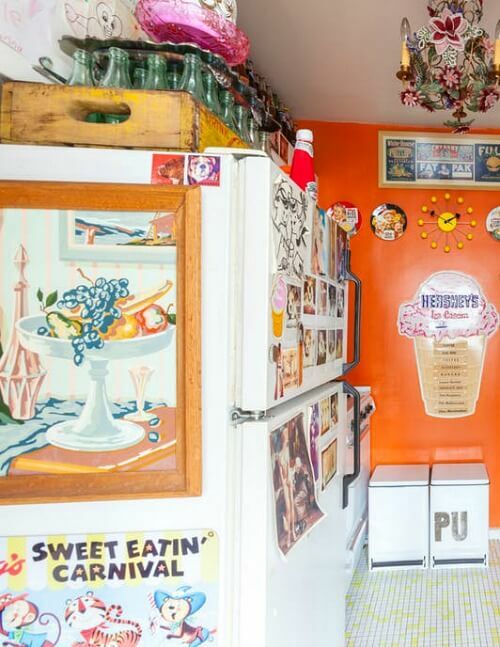 Her fun and colorful apartment is 900 square feet and she has rented it for the past 24 years. 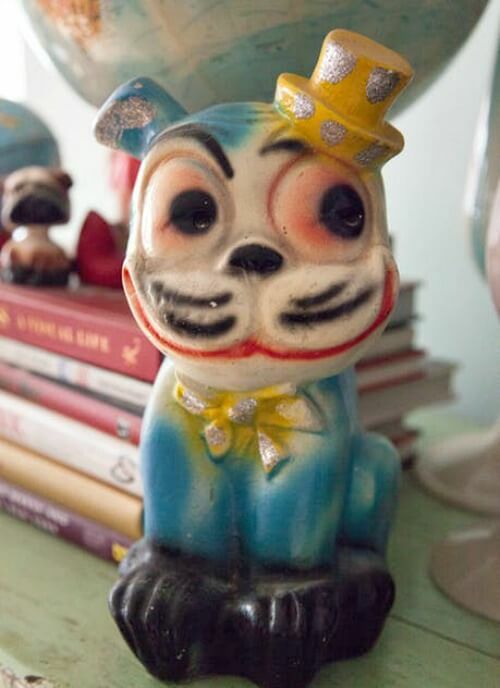 Jeanie has been collecting since she was five years old. 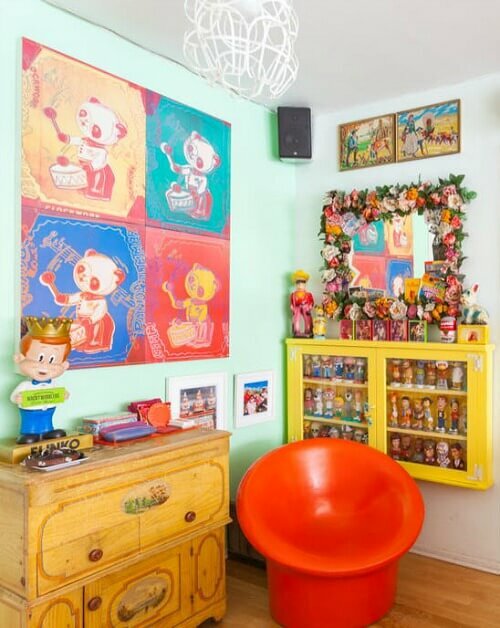 Her apartment is reminiscent of a curated mini pop culture museum. 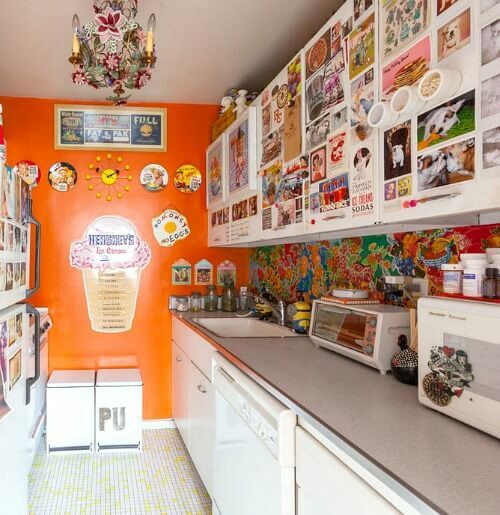 Bold colors on walls and animal prints on furniture, multi-colored PEZ dispensers, bobble heads and tea cups fill every nook and cranny. Jeanie is a professional organizer. 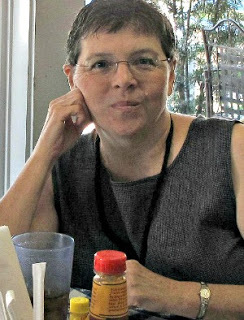 She has been referred to as “The Chaos Conqueror.” She helps her clients create polished, cohesive and efficient home and work spaces. Jeanie says she smiles every time she opens the front door. 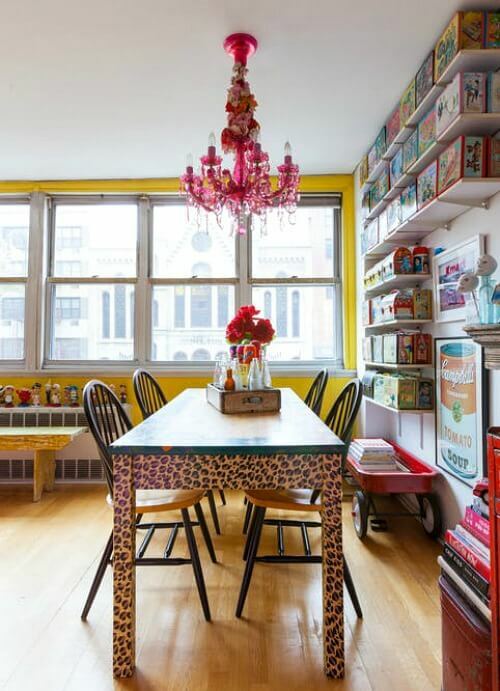 Her home has a vibrant East Village location that reflects the color and energy of her home. She says that the action on the streets adds to her home’s atmosphere. Her favorite thing about her apartment are the nine windows that run the length of her apartment. Her least favorite thing is all the dust her collections collect. She says each collection gets a deep clean once or twice per year. 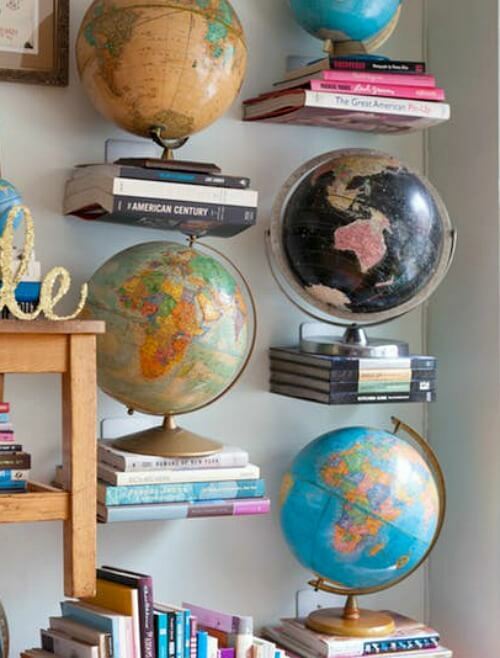 Jeanie created shelves made of books that hold her collection of globes. Above you see a vintage wagon filled with books. Books seem to be everywhere. More collections and what appears to be a pet gate for her dog. 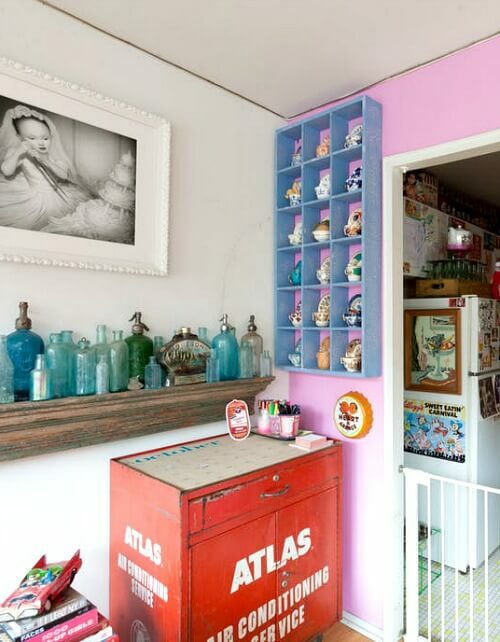 She uses vertical space for many of her collections and displays. She even makes a display of her shoes. Above is one side of her galley kitchen. Below is the other side. She says she’s accepted that her kitchen will never be renovated because she rents. Her bedroom is a bit more sedate. She has a small desk holding her computer in the corner by the window. I think it’s fun the way she has painted her walls in various colors even in the same room. And above is her beloved dog Tator Tot. I hope you enjoyed this apartment tour. I imagine you now have your color fix for the day! I like vibrant colors, but this is a little too much for me. All of the organized clutter would drive me crazy. My eyes had no where to land. I applaud her for having the guts to do this. I can see her living the Bohemian live style. It’s even a bit too much color for me. But she does organize it all well! Wow this one has lots of color. A bit much for me but she has some interesting collected pieces. Love that little tatter tot. How adorable is he. Have a great week. Me too. But it was such a fun apartment I had to show you all. I love the colors and it’s a fun place but I would never be able to relax with so many bright colors. My first reaction was it was like going to Disney World or the circus. Thank you for posting it…we all have different ideas of our perfect place to nest. Wow! I like some color, that would overwhelm me, so busy. But too each his own! Oh my…. I absolutely love her home! I could move in there real easy! Who needs an updated kitchen? With her collections it works just fine… Thanks for sharing! I know. Who would even notice the kitchen??? The animal prints aren’t my thing. But her place reminds me of a museum or curated things so I knew I had to show it to you. Very colorful and fun. I would smile when I walked in the door as well but I think the busy nature of all the collections would wear me out. Love the light from the windows. And Tator Tot is so cute! What I’d give for all that natural light. You could have a veggie garden with that much light! She sure has things organized well. Wow. Way too much stuff to dust. I don’t think I’d hire her for organizing….she wouldn’t let me get rid of anything. I kind of admire people who can live with that much visual clutter but it’s not for me. Infact, that makes me want to paint a few rooms white. It’s fun to look at I think anyway. Wow was that ever a fun tour. I loved it. Granted it is a lot but some of her displays are fantastic. I knew many wouldn’t wish to decorate that way. But it’s such an interesting apartment! She does have it well organized. I admire her for doing her “own thing” no matter what the current trend is—but I couldn’t live with all of that busy-ness. I love the chairs/desks hanging on the wall; I’ve done this with a child’s chair and it really adds interest. Thanks for a different tour. That was my intent. Showing something a bit different. I think I like this lady very much ! She may be more colorful than you Brenda ! 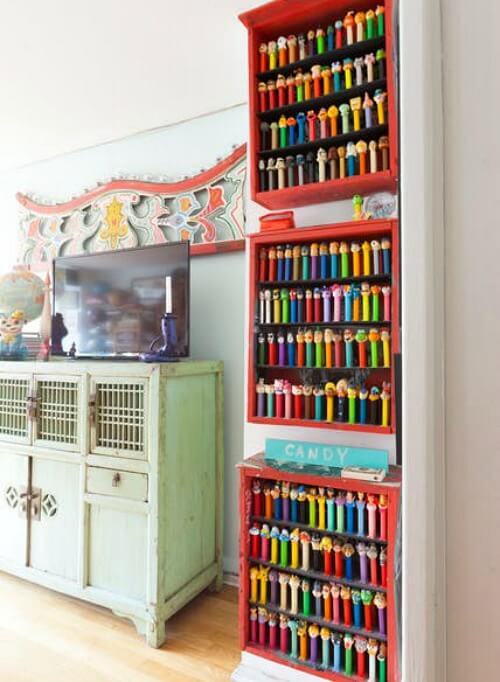 I love her Pez collection. Love her collections too! Bet she’d be great fun to sit and talk with over a cup of tea . What I love about this apartment is the openness and feeling of expansiveness. And she’s achieved this while at the same time having a lot–I mean a LOT–of things displayed. Is it all one room, do you know? It looks like the bedroom is part of the rest of the apartment. I couldn’t live with that much going on, either, but one thing I really envy about the place is the wall space for hanging and displaying. I say that because I have so little compared to the number of things I would like to hang up. And, gosh, that huge expanse of windows is to die for. I love windows and lots of light in my living space. It was fun to see, Brenda. Thanks for the post and hope your week is off to a great start. I LOVE it!! All those windows and a REAL kitchen in NYC!! And the color! I love that too! I’ve been going thru and deleting all the “white” blogs from my subscriptions. I feel they are just too cold and boring to bother reading anymore. I just can’t imagine living in a house like that. Give me color and personality! But that is what is so great about all the blogs. You can find your “tribe”. Whatever suits you! I couldn’t live there even though it’s organized. 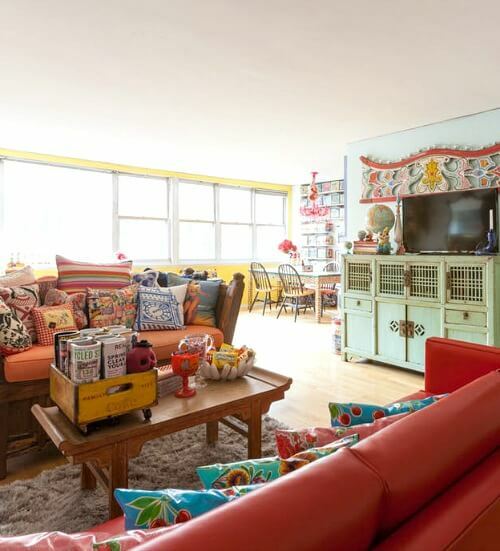 Very colorful for a NYC apartment, indeed! 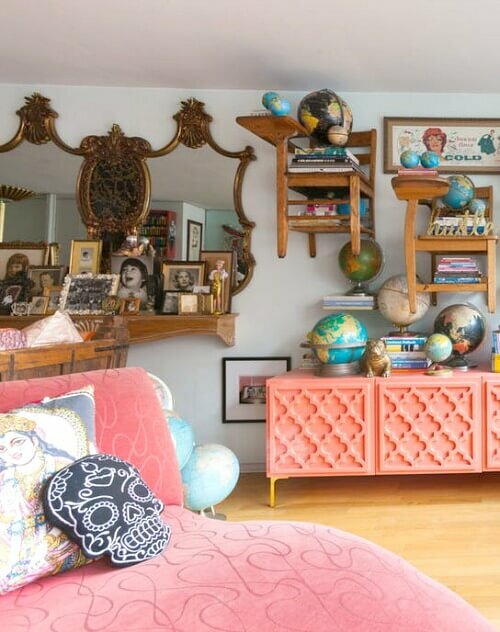 I do love the book shelves and the globe collection. What a fun space! That’s a huge apartment for NYC, and no doubt her rent is crazy cheap because she’s been there so long! Brenda that is one unique apartment. I wouldn’t mind moving in with her such a great space. But I wouldn’t want to dust.